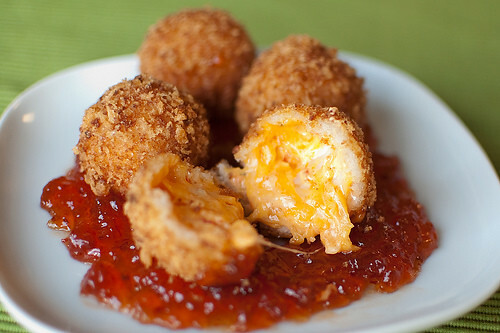 Cheese fritters are a great meal that can be enjoyed if you prefer to have something filling or a snack sans meat or fish. The best thing is that fritters can be made with any left-over bits of cheese whether it is cheddar, feta, gruyere, pepper jack or mozzarella. They can also be served with marmalade or chutney to give them a little extra zest. First in a bowl sift flour, salt, and cayenne or black pepper, chopped onions, chopped scallions, and thyme. Make a hole in the centre of the blended flour and add two eggs. Whisk batter combining the eggs with two tablespoons of olive oil and two tablespoons of milk. Next grate in the cheese and stir all together. Let the mixture sit for a few minutes while you heat a saucepan with oil. Once the oil is hot use a large spoon to scoop up batter and drop medium size dollops in the pot. Fry until golden brown. Once cooked, remove the fritters and place in a sieve or silicone paper to drain off extra oil. The marmalade can be bought or you can make you own using sugar, cider vinegar, sweet peppers, oil, and garlic. Over a medium heat carmelise sugar and onions, sweet peppers, and garlic. Turn down flame until sauce is thick. Do not allow the mixture to burn. Turn off stove and allow marmalade to cool.